After almost four years at the top, some would argue that change was long overdue. Since the original iPad launched and single-handedly kickstarted the tablet revolution in 2010, the device has grown in technological stature but remained fairly constant as far as physical form is concerned. The fifth generation model - blessed with the "Air" suffix - marks something of a departure from what has gone before, looking more akin to its smaller sibling, the iPad mini. This is the lightest large-screen tablet device on the market right now, and you'd be surprised at how much of a difference that makes during regular usage. Indeed, it's the iPad Air's outer design that has more of an initial impact than the state of the art silicon that lies within. It's much thinner than the fourth generation model, and noticeably lighter too. The bezel that surrounds the screen has drastically changed; when held in portrait, the spaces at the top and bottom of the screen are much larger than those on either side. This might lead you to assume that fingers are more likely to creep onto the display when holding these reduced edges, but that isn't the case. By shaving excess space from the sides, Apple has fashioned a slate that feels more compact without reducing the screen size. 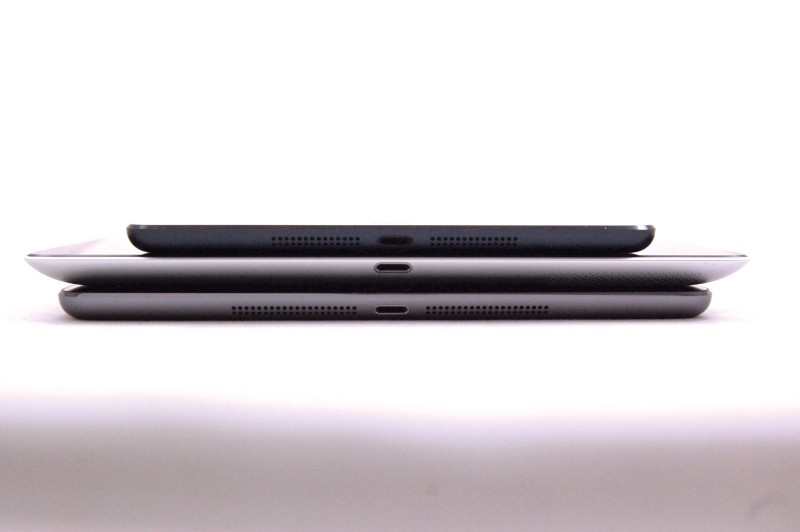 At just 7.5mm thick, the Air is the thinnest 9.7-inch iPad yet. This - combined with the reduced width when held in portrait - means that Apple has delivered the Holy Grail of this particular sector of consumer electronics: a large tablet which is comfortable to hold in one hand. You could argue that this is something of a first for a device of this size; certainly, supporting previous iPads with a single arm placed a considerable strain on the wrist. 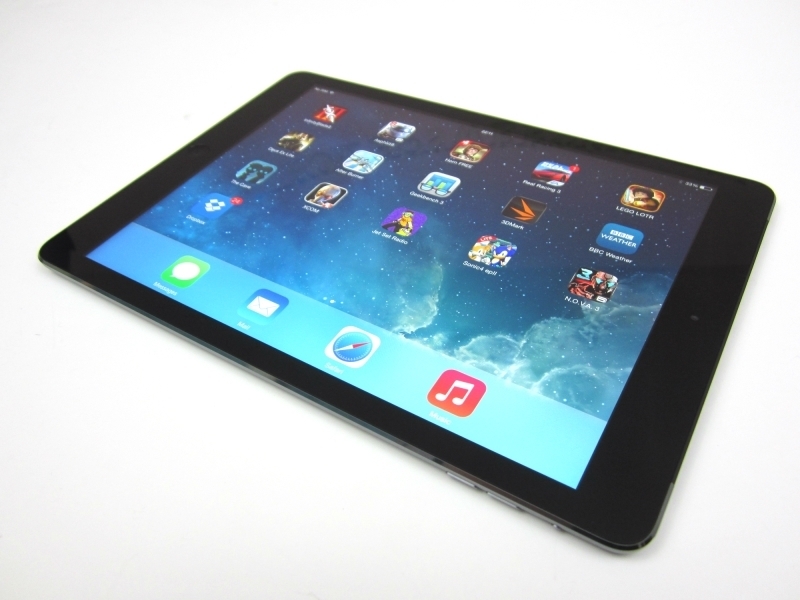 Smaller tablets - such as the aforementioned iPad mini and Google Nexus 7 - are traditionally favored when it comes to single-handed operation, but Apple has finally managed to bring the same quality to a tablet with a big, roomy screen. Enclosed within that super-svelte frame is the same chipset that powers the iPhone 5S: Apple's A7, supported by the M7 motion coprocessor. Clocked slightly faster than the chip inside Apple's current flagship phone (1.4GHz as opposed to 1.3GHz in the 5S - though with more thermal headroom to run the GPU faster, for longer), the A7 delivers excellent performance in almost every aspect of the tablet's functionality. Navigation around the cartoon-like iOS 7 interface is buttery-smooth, applications load swiftly and 3D games perform with the sort of pace that is rarely seen on this kind of platform. From an aural perspective, the iPad Air finally takes the range into the world of headphone-free stereo. Twin speakers sit on the edge closest to the home button, which is fine when you're holding it in portrait but less useful in landscape. On previous models, the single speaker was placed in a similar location but slightly higher, avoiding the issue of covering it with your hand when using the device in landscape orientation. Here, the speakers are more to the middle, and when you're gripping the Air on both edges, it's almost impossible not to obscure them. The stereo effect is also lost when using the device this way, as both speakers are on same edge. Despite the changes in the hardware, there are many elements that remain largely untouched. The screen has the same 2048x1536 resolution with a pixel density of 264 pi - that's lower than the 299ppi offered by the Samsung-made Nexus 10. Pixel-related bravado aside, it matters little - the LED-backlit IPS panel is pin-sharp, bright and deliciously colorful, making both still and moving images look very impressive indeed. Color reproduction also seems to have been given a bit of kick since the iPad 4 - offering an even richer presentation. The 4:3 aspect ratio will continue to annoy those who crave a true widescreen experience, but for those individuals there are always Android-based alternatives. The 5-megapixel camera is another component which remains unaltered, which will prove bothersome for the minority of users that seriously consider a tablet to be a legitimate photographic device. The fact that Apple has held back on an upgrade in this area - coupled with the continued absence of an LED flash for low-light shooting - suggests that even the iPad's creator doesn't feel image capture to be one of its key features. More important is the front-facing 1.2 megapixel snapper, which allows you to make FaceTime video calls. Those of you hoping to see the Air come with the Touch ID fingerprint scanner showcased by the iPhone 5S will also be sorely disappointed, but such highfalutin' security arguably makes less sense on a tablet. With a phone, you're usually the only person who uses it, but with an iPad it's more likely that you'll share the device with your entire family. The touch ID panel would work well for preventing unruly offspring from accidentally racking up a massive credit card bill on the App Store, but it would become an annoyance if deployed to unlock the Air every single time it falls asleep. With Apple being Apple we don't doubt that the fingerprint scanner will make its way onto an iPad model in the not-too-distant future, but it's not a feature we found ourselves yearning for at any point. If you've yet to upgrade your existing iPad to iOS 7, you may be in for a shock when you switch on the Air. It's the first in the iPad line to come pre-loaded with Apple's new mobile operating system, and marks a significant departure from previous iterations. The skeuomorphic visual style has been jettisoned in favor of an almost child-like aesthetic that makes iOS look more like Android than ever before. This is amplified by the fact that Apple has borrowed some key elements from Google's OS, such as a multi-tasking window where apps can be "swiped" out to close them and a slide-up Quick Settings panel that emulates similar systems seen on the likes of the Samsung Galaxy S4 and Nexus 5. Compared to the freedom of Android, iOS continues to feel limiting and restrictive - sharing items between apps is either fiddly or totally impossible, a notable drawback when compared to the far-reaching, system-wide implementation on Google's platform. You can't side-load games and apps and the multitasking isn't as impressive - iOS simply "freezes" applications and restarts them, rather than allowing them to run in the background. However, weaknesses have a funny habit of becoming strengths; iOS is more intuitive - especially on a large-screen device - and by holding back on power-hungry processes, Apple has ensured that its latest slate boasts striking stamina. Ten hours per charge is the figure quoted by Cupertino, and some of our tests actually topped that amount by a small margin. When you consider that the Air has a smaller capacity battery than the fourth gen model (8827mAh down from 11560mAh), that's a remarkable achievement. Perhaps more so than any other tablet device, the iPad makes for an excellent gaming platform. Developers have embraced the larger screen size to create unique experiences, and as a result the library of must-have iPad titles grows larger by the month. We tested the likes of XCOM: Enemy Unknown, Deus Ex: The Fall, Real Racing 3, NOVA 3, After Burner Climax, Infinity Blade 3 and Asphalt 8: Airborne, and all performed better than we'd seen on any previous tablet device. Having to support so many different hardware permutations - across not only iOS, but Android as well - often means that mobile games don't feel like they're making the most from the host system; Gameloft's Asphalt 8 suffers from occasional performance drops on the Tegra 4-equipped Nvidia Shield, for example. That never seems like an issue with the Air; every game we threw at it ran seamlessly, as if it had been built from the ground-up for this very device. Thinner, lighter and more powerful than its forerunner, the iPad Air could be seen as merely another evolution of the lineage; Apple has created an appealing slate but has left enough wiggle room for next year's model to improve. The screen resolution remains the same as the fourth gen iPad - as does the 5-megapixel camera - and there's no Touch ID to be found, although the suitability of the latter feature on a tablet device is debatable. However, instead of focusing on what hasn't changed, it's much more sensible to look at what has. It may have taken Apple four generations to get to this point, but the Air really does feel like the perfect tablet from a purely ergonomic perspective. At no point does it seem too heavy or bulky, and it's possible to hold it with one hand over long periods without feeling any kind of strain or discomfort. After the release of the iPad mini, we found ourselves less likely to use our much more powerful iPad 4 for anything other than 3D gaming - the form factor just wasn't as appealing. The iPad Air changes that: this is a larger tablet that simply feels right. In many ways, its state of the art performance is just the icing on the cake. Finally, there's the price - with prices starting at Â£399 for the 16GB WiFi model, the Air is a seriously attractive proposition, especially when you consider that many Android slates are coming in for roughly the same cost. In terms of design and build quality, there really is no competition in this sector. The iPad enjoys not only a physical advantage over its Google-based rivals, but is also supported by a massive selection of exclusive applications and games - something which Android cannot currently offer its tablet users. It's also a much more appealing device to use than any Android tablet we could mention; iOS 7 may be more limited and still has some development ahead of it before it, but using it seems to come naturally on a large-screen product. There are minor imperfections here that will no doubt be fixed in future models, but even with poorly-placed stereo speakers, a weak camera and a screen resolution that is no longer best in show, the iPad Air is still the most accomplished tablet device money can buy at this present moment in time - and that could remain true for much for 2014.